My father passed away in Feb 2012. He suffered a massive stroke a year and a half before and after a few months of optimism on our part, he started a slow and fateful decline, so his passing was not unexpected. This is how I will always remember my relationship with my dad. The two of us sitting around doing something nerdy involving computers or electronics. He taught me to program and fueled that passion as often as he could. 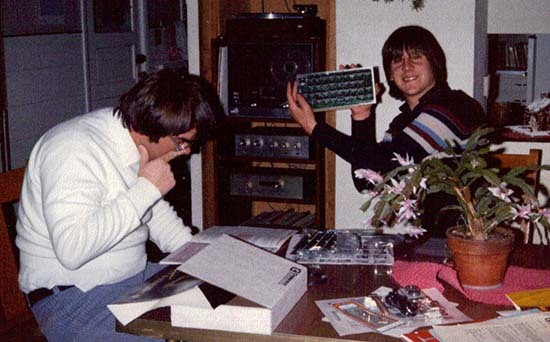 We owned a home computer before the Apple II existed and even before most people knew a computer could fit in someone's house. He had a Ph.D in Astrophysics and it's hard to describe how wonderful it was growing up with a father who could answer absolutely any question I had about spaceships, rockets, planets, stars, galaxies, quasars, black holes, asteroids, the sun or the moon. I could point into the night sky and ask "what's that?" and he could tell me after only a moment's hesitation. I am who I am today because of him. Maniac Mansion, Monkey Island, Putt-Putt or Pajama Sam would not exist if not for him and the way he taught me to think and devour learning new things. He taught me to love to read, appreciate art and to always question my own beliefs and to be curious and inquisitiveness. I'm sad he is gone and will miss him terribly, but I will forever be grateful for what he left me. Our life on this earth is not only what we did, but what we left behind for others. What is one + three + three?